Personalised assurance – be free to be you. 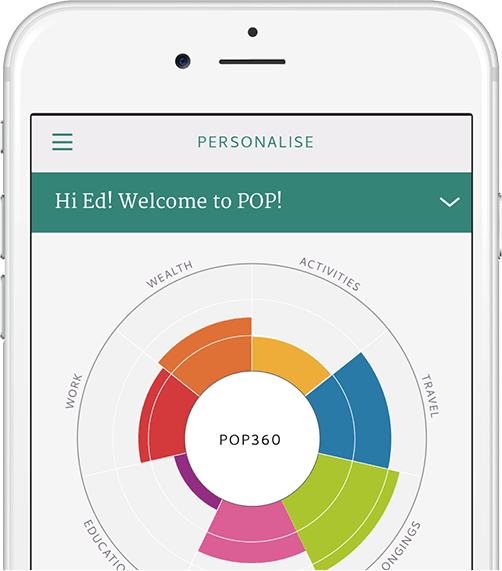 Launching in 2016, POP brings you insurance synced with your life, driven by your data and delivered on your mobile. Be one of the first to experience personalised assurance. 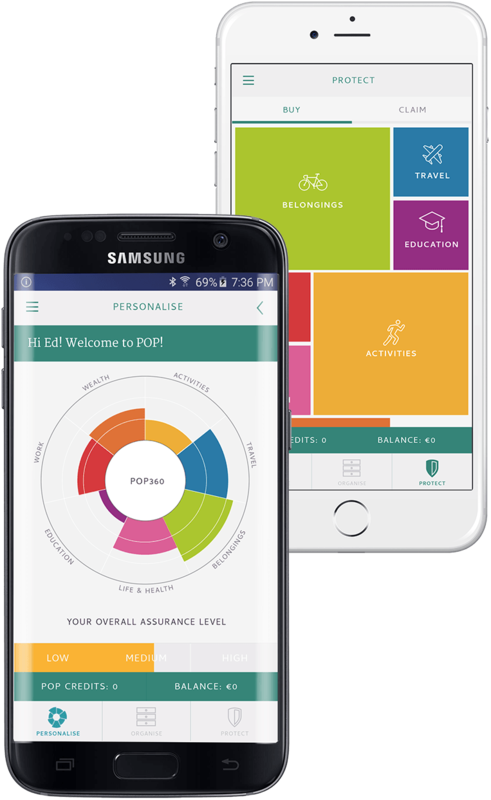 POP is changing insurance by putting you, and your unique life, at the heart of it. When you sign up, you allow POP to use the data from your phone, along with other publicly available data, to deliver essential protections. So you have assurance wherever you are, whenever you need it, at the right price. Buy protections on your phone or tablet and all of your documents and information are securely stored in the app, so you can find them easily, anytime. 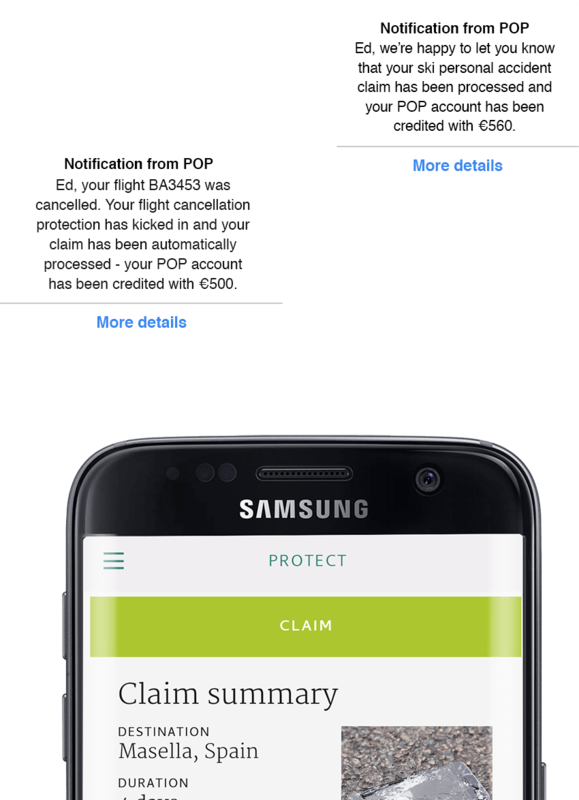 And POP lets you make a claim quickly and simply, right there and then on your mobile. Personalised assurance is delivered through the ‘POP trinity’ of Personalise, Organise, Protect. The Pop360 interactive graphic is at the heart of POP. It gives you a live snapshot of your personalised assurance profile. It’s driven by who you are, where you are and what you do. It helps you focus on the elements of your life that are assured, and those you may want to protect better - some of which you may not have even thought of. By interacting with the Pop360, you can buy protections to fill the gaps in your existing cover. PopUP notifications also keep you up-to-speed with new assurance information that is personalised for you and your life in real time. POP automatically identifies and stores your assurance-related data, securely, in the POP app. So it’s easily accessible, all in one place, whenever you need it. No more hassle trying to find letters and up-to-date policies from insurance companies. 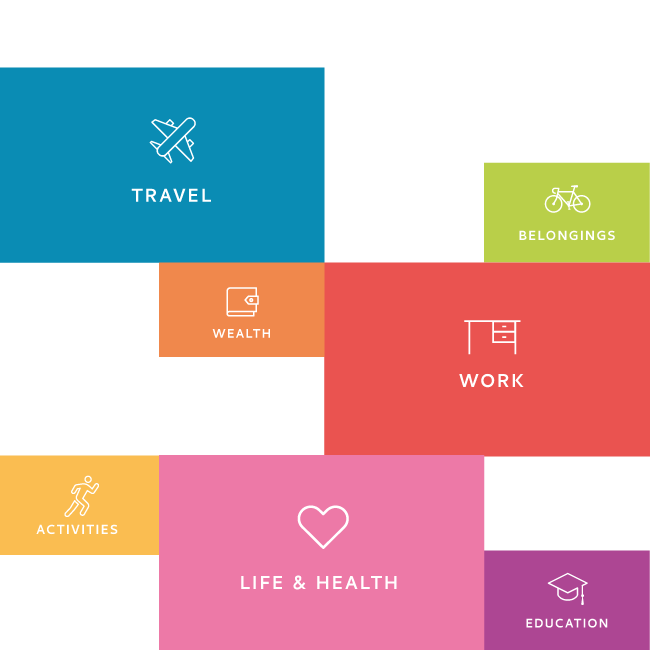 POP also automatically identifies and stores information about the things you own, helping you to value and insure them. And it finds and organises your personal data assets, so you can value your data, protect it and, ultimately, monetise it – watch this space. POP lets you know when it’s time to renew an existing protection, and when you should think about a brand new one. It also alerts you when your protections need to be altered to match where you are and what you’re doing. And you can do all of this simply and quickly on your mobile. The protection documents are generated the moment you buy and are stored securely in the app for instant, easy access. POP’s claims process has been built from scratch and streamlined to work for you with no fuss. Claims are processed quickly and easily via your mobile. And some, like flight delays and cancellation claims, are even processed automatically. The money you are due is credited directly to your POP account – it’s that simple. POP believes that your data is just that – yours. And, like any other asset, it has a value, so it needs protection around the clock. 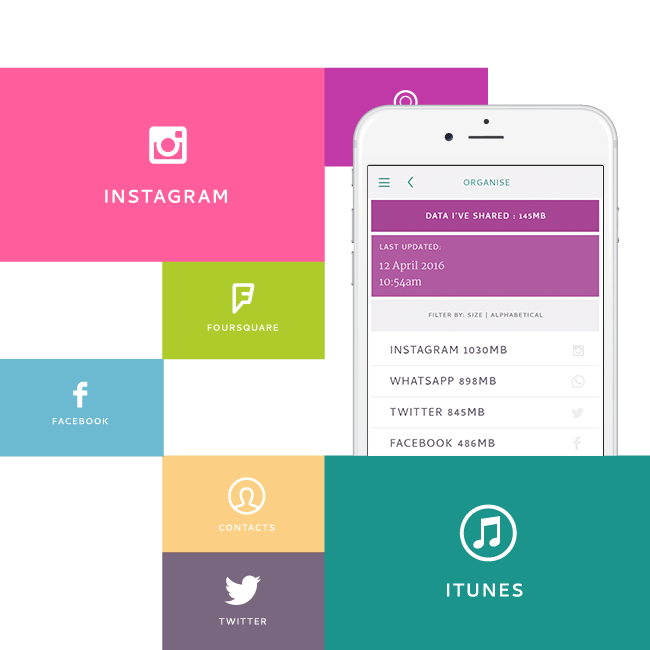 POP helps you find, value, securely store and protect your personal data. POP works with Brand Partners to deliver personalised assurance to their customers. Our partners share our belief in the importance of putting their customers first, empowering people to live their lives to the full. We are dedicated to building a different type of company, one with real purpose, empowering people to live life to the full, by delivering personalised assurance products and services. Our headquarters are in Barcelona, Spain, with our Asia-Pacific activities based out of Sydney, Australia. Killian is POP's Founder & Group CEO, based in Barcelona. 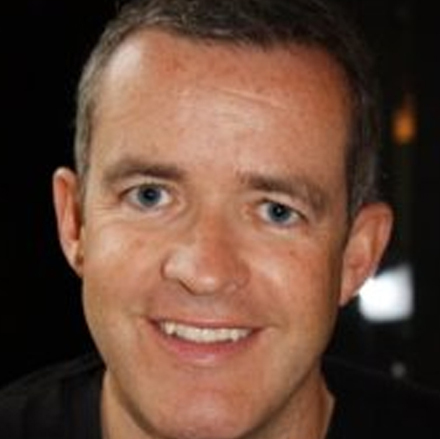 Originally from Ireland, Killian has lived and worked in multiple countries over the past 22 years. He’s married to Pepa and father of Ryan (with a baby brother on the way in 2016!). He has a passion for travel, exploration, sports and culture, and a keen curiosity for learning and people's potential. He has travelled an eclectic entrepreneur's and intrapreneur's journey that spans the industries of insurance & finance, social media & publishing and talent & leadership development. Killian's collective experiences have led him to create POP - a different type of company - one with real purpose, to empower people to live life to the full. 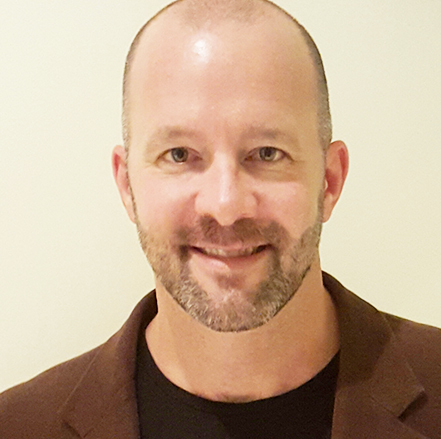 David Rogers is CEO of POP Asia-Pacific and is based in Sydney, Australia. Originally from Michigan, USA, David now lives in Australia with his wife Gayle and their two sons Jaspar and Jonah. He’s enjoyed a 20-year global insurance career developing start-up businesses in Bermuda, North America and Asia-Pacific. As an entrepreneur, David is focused on activities that deliver real value to customers and develop lasting innovation-driven ecosystems and partnerships. David believes in actively empowering people and strong communities - through his family's local charity work with organic foods and by bringing POP to the Asia-Pacific region, David wants to be a conduit for real change, at a grass roots and global level.